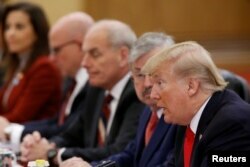 U.S. President Donald Trump on Thursday said the United States and China must work together to liberate the region and the world from what he called the very serious threat posed by the “murderous regime in North Korea. Secretary of State Rex Tillerson, who is accompanying the president, told reporters after the meetings that the Chinese, have been clear and unequivocal over the two days of talks that they will not accept a North Korea with nuclear weapons. 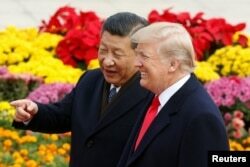 “I believe there is a solution to that, as you do,” Trump told Xi during an extended bilateral meeting Thursday morning in the Chinese capital. U.S. President Donald Trump and China's President Xi Jinping hold bilateral meetings at the Great Hall of the People in Beijing, Nov. 9, 2017. Workers install glass panels near a McDonald's in Beijing, Nov. 7, 2017. U.S. President Donald Trump is in Beijing amid mounting U.S. trade complaints, with limited prospects for progress on market access, technology policy and other sore points. U.S. President Donald Trump and China's President Xi Jinping attend a welcoming ceremony in Beijing, Nov. 9, 2017. The Chinese leader predicted “there will be a wider and prosperous future for cooperation on trade,” specifically mentioning the oil and gas sector, beer, agricultural products, education and service contracts. He also invited more American companies to participate in China’s “One Belt One Road” initiative, an effort to create the world’s largest platform for economic cooperation, inspired by the ancient Silk Road trading network. President Donald Trump, first lady Melania Trump, left, Chinese President Xi Jinping, second right, and his wife Peng Liyuan, right, stand together as they tour the Forbidden City, Nov. 8, 2017, in Beijing. The two leaders walked side by side on a red carpet at a welcoming ceremony early Thursday at the Great Hall of the People in Beijing. The U.S. and Chinese national anthems were played by a military band and ceremonial cannon fire from Tiananmen Square saluted Trump. An exuberant crowd of schoolchildren waved U.S. and Chinese flags. U.S. President Donald Trump delivers a speech at the National Assembly in Seoul, South Korea, Nov. 8, 2017. “You cannot support, you cannot supply, you cannot accept,” he added. 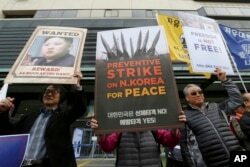 South Koreans protest against North Korea and Kim Jong Un during a rally near the U.S. Embassy in Seoul, South Korea, Nov. 6, 2017. 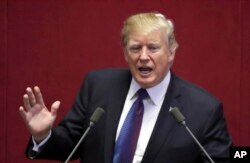 The U.S president referred to North Korea as “a total failure,” and a “twisted regime” ruled by a cult and a tyrant who enslaves his people, a characterization certain to provoke a harsh rhetorical reply from Pyongyang. The U.S. leader had effusive praise for South Korea, contrasting its economic success with what he characterized as the “dark” situation in the North. “The more successful South Korea becomes, the more decisively you discredit the dark fantasy at the heart of the Kim regime,” Trump said. VOA's Bill Ide and Marissa Melton contributed to this report.